Introduction: In 2003, the Accreditation Council for Graduate Medical Education (ACGME) mandated duty-hour restrictions for US general surgery training programs “80-hour workweek”. At that time, our program initiated a night-float rotation to cover new general surgery consultations between the hours of 6PM and 6AM, Mondays through Fridays. Daytime and weekend consultation coverage remained the responsibility of the service-assigned residents on a rotating schedule. The aim of this study was to assess variations in the efficiency of care for appendicitis patients treated at a single academic medical center before and after implementation of the 80-hour workweek and night-float system. Methods: Time to definitive treatment for acute appendicitis was the primary outcome. Hospital, emergency room (ER) and operating room (OR) databases were queried for all appendectomies from calendar years 2002 and 2007, before and after the 80-hour workweek respectively. Average time from ER to OR and duration of operation were compared between 2002 and 2007 using the unpaired t-test. In addition, subgroup analyses were performed for patients presenting on weekends and weekdays, and on weekdays 6AM to 6PM and 6PM to 6AM. Results: Mean ER to OR time was 621.8 minutes in 2002, and 607.8 minutes in 2007 (p=NS). Mean appendectomy time was 68.1 minutes in 2002, and 73.6 minutes in 2007 (p=NS). From 2002 to 2007, ER to OR times trended lower on weekdays (p=NS) and higher on weekends (p=NS), with a statistically significant improvement on weekdays during nights (table below). 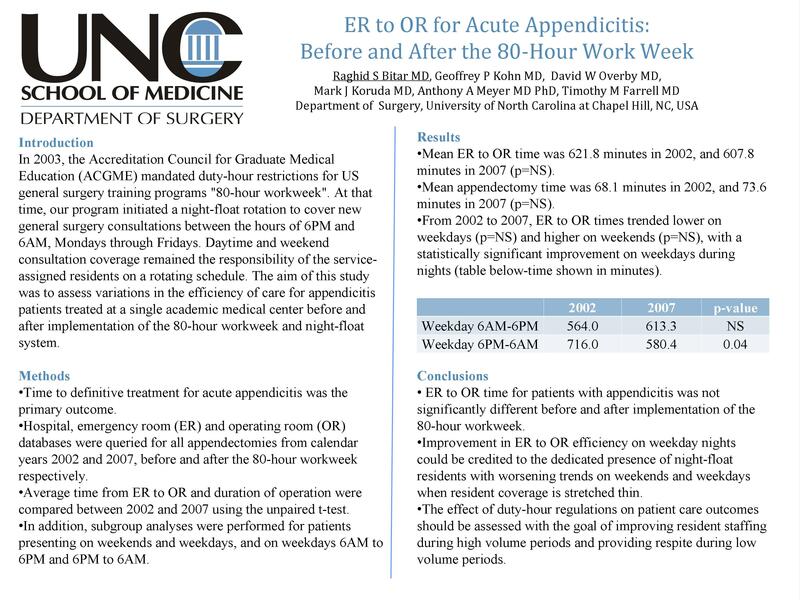 Conclusion: ER to OR time for patients with appendicitis was not significantly different before and after implementation of the 80-hour workweek and a night-float resident coverage system. Improvement in ER to OR efficiency on weekday nights could be credited to the dedicated presence of night-float residents with worsening trends on weekends and weekdays when resident coverage is stretched thin. The effect of duty-hour regulations on patient care outcomes should be assessed with a goal of improving resident staffing during high volume periods and providing respite during low volume periods.